Another gardening guest post courtesy of Matthew, AKA Farmer Brown. For all things garden-related, check out the new Browns’ Green Garden page. I’ve been gardening for a while now, and I’ve watered by hand, from rain barrels, with a sprinkler, and with soaker hoses. By hand can be very precise, and allows use of rain barrels, but takes a lot of time once you have a larger garden. Watering with a sprinkler saves a lot of time, but is relatively wasteful of water. You lose some of the water to evaporation (depends on relative humidity, wind speed, and time of day), but all that wet foliage also increases the risk of a number of plant diseases. Watering with soaker hoses is more water efficient than the sprinkler, but one soaker hose costs a decent bit, and then you must leave it in place and move the connector hose between soaker hoses, or laboriously move the soaker all around (soakers are easier to use with row gardens, but row gardens do not use precious garden space very efficiently, so I use 4’ wide beds, which require soakers to be snaked among the plants. 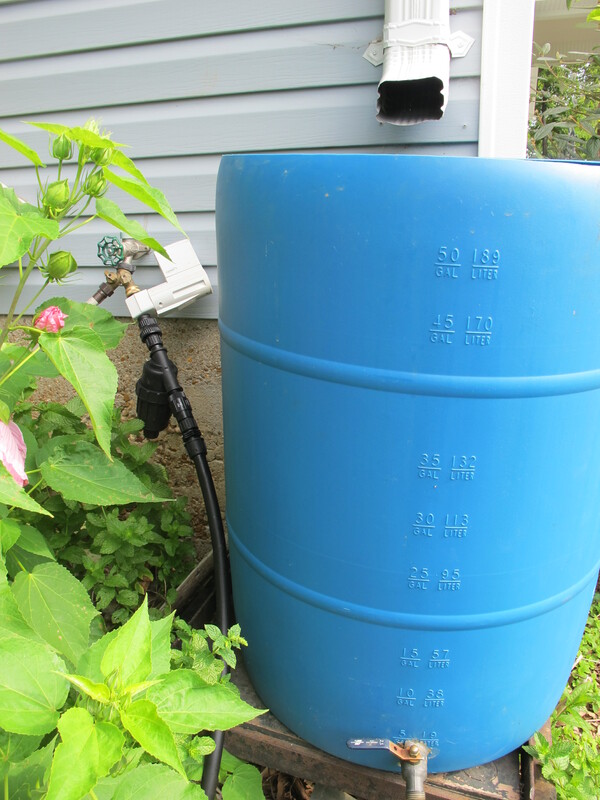 I’ll still use my rain barrels, both by hand watering and watering with a hose. I’m also still pondering setting up a siphon system to increase the storage and move the water closer to the destination, but this system promises to dramatically decrease the time watering (my mom was moving the sprinkler to four locations to water the whole garden), decrease water use, and decrease plant diseases in my garden. Here’s hoping it delivers. 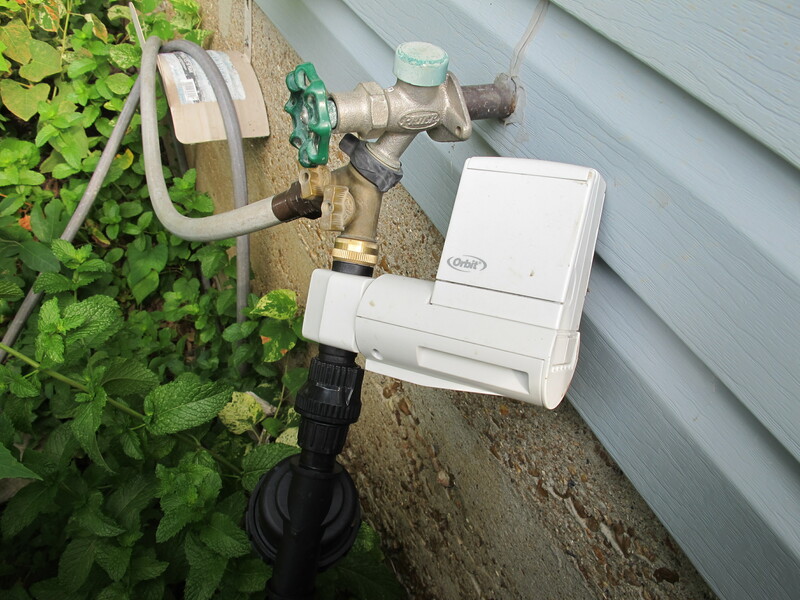 Drip systems take significant money and time to set up (and to learn enough about them to order one), but they allow a gardener to deploy the system and leave it in place, deeply watering the whole garden by timer without getting foliage wet. While they cost a lot, they cost less than enough soaker hoses to water a garden, and entail much less effort than moving a hose about, and much less risk of damaging plants with hoses. They do require the gardener (and anyone else in the garden) to be careful not to damage the system. Thanks to a biodiversity grant from Slow Food St. Louis, I’ve taken the leap and invested in a drip system. It took me about eight hours, spread out over a number of days, to understand the parts of the drip system, how the parts go together, the different flow rates of different components, costs and benefits of high vs. low flow, and the various calculations you need to make. 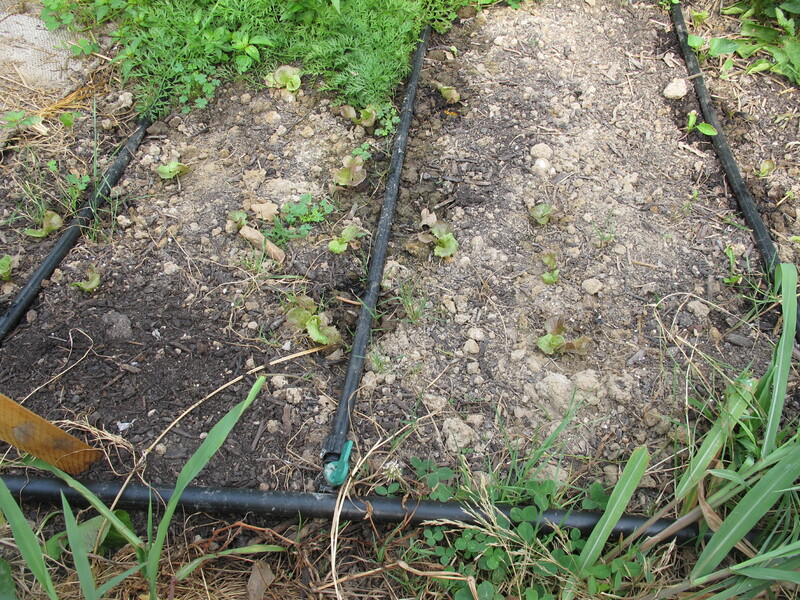 I knew I was just doing garden beds, so I simplified matters by only investigating emitter tubing and drip tape. Using the Dripworks’ T-Tape estimator, I determined that with low flow T-Tape I could do my main garden on one zone. Later I learned, luckily in time, that to do such a large zone I’d need to use 3/4” mainline tubing to allow sufficient flow rate to support such a large zone (most kits include the more standard 1/2” mainline tubing which can only handle 240 gallons per hour, but 3/4” supports up to 480 gallons per hour). I debated drip tubing vs. drip tape, but the tape costs about a quarter as much and was available as lower flow with more emitters per linear foot and theoretically lasts pretty well. I decided that the tape was worth a try, especially since the price of doing the whole garden with tubing would have been a much larger expense, and the benefits of the system are greatest with as much of the garden covered by it as possible. I also realized I could save money, time, and water by doing each 4’ bed as a valved barb (so the water supply to the bed can be turned off), a run of drip tape, a T shaped connector, two short bits of drip tape, a 90 degree connector, and two more runs of drip tape. It took about sixteen hours to install, and I learned that while most instructions say to tighten drip locs for drip tape by hand and fold ends of drip tape once or twice, if you want them not to leak you should tighten with pliers and fold ends of drip tape twice. There are many drip irrigation suppliers and companies out there; these are the two I used. I purchased most of my supplies from Irrigation Direct with their competitive prices and free shipping, but they don’t make or carry low flow drip tape, so I got low flow drip tape (T-Tape) from Dripworks. 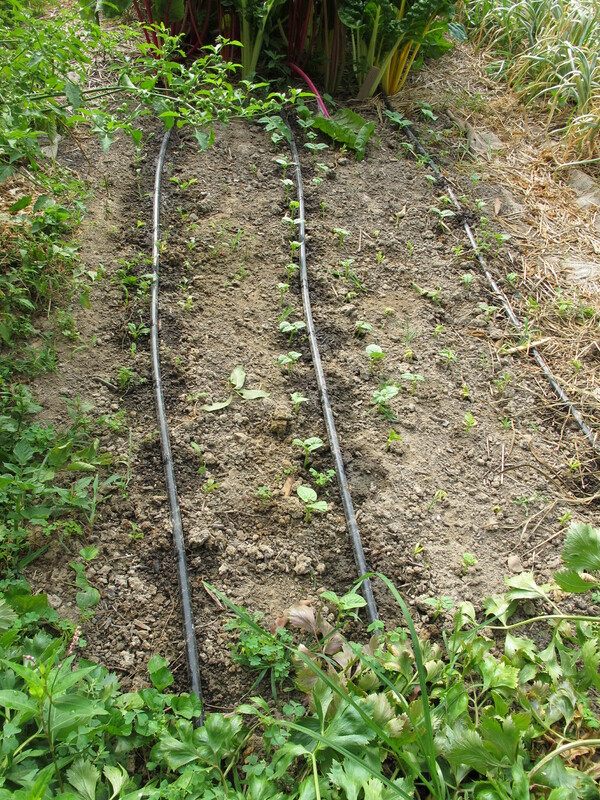 This entry was posted in Garden, Green Ideas and tagged Drip irrigation, gardening. Bookmark the permalink. This is great. I’ve had a hard time getting sprinkler systems to work and keep my plants alive. But this looks like a pretty straight forward good way to go. Thank you for sharing this! I have been searching for the best irrigation systems in Calgary to help my lawn to look green all the time. This provided me with some great insight!